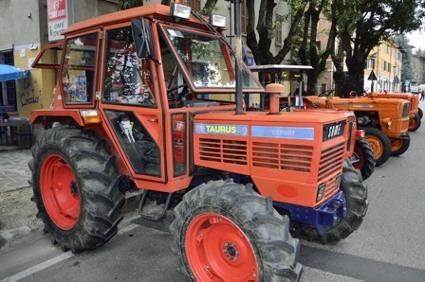 North Bucks Vintage Tractor Club: Season's greetings from Italy! I think that every region, every town or every community in Italy think that they make the best food in the world! Here in the region of "Emilia Romagna" they obviously do believe that, and they are extremely proud of their local produce! If you are pondering a visit to this land the first weekend of October is a date you may want to consider marking on your calendar. 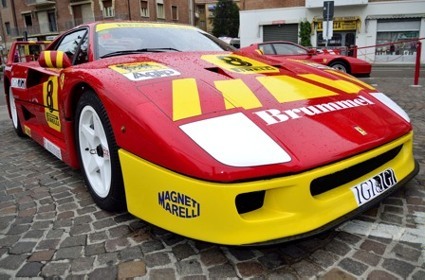 On the first Sunday of October the "Grand Prix of flavours" takes place here in Maranello. 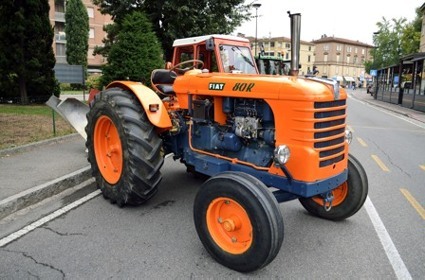 It's a great festival that combines excellent food, extremely expensive sports cars, and a great deal of vintage tractors! Just strolling along the main streets you will find several stalls selling a great variety of cheese, wine, cold cut meats and the unmissable balsamic vinegar. You can dine happily on street food the Italian way. That is, with a good portion of freshly cooked tortellini served in a paper bag like those we know very well for fish and chips! Local artists take to the streets as well with their displays, and you can take the opportunity to stock up on Christmas presents! Local clubs take some very interesting classic Ferraris to the streets, which make quite a unique contrast with a very large number of vintage tractors! 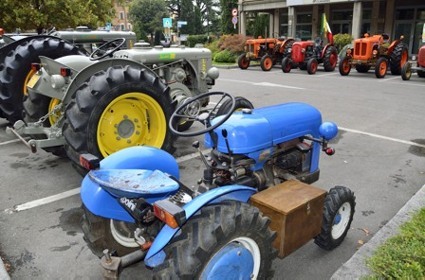 Being in Italy the great majority of the tractors will be FIAT, OM, Same and the ever present Landini hot bulbs. Looking quite closely at the many displays I managed to find something else too, like one Porsche diesel tractor and a huge 400 HP John Deere that a farmer decided to park right in front of the Ferrari store! Here in my latest post you can see a few pictures from the event, just to give you an idea! As the last website update of 2017 is about to go live it is also my opportunity to wish all the Club members and all the fellow tractor enthusiasts visiting this website a very good Christmas and a Happy New Year!